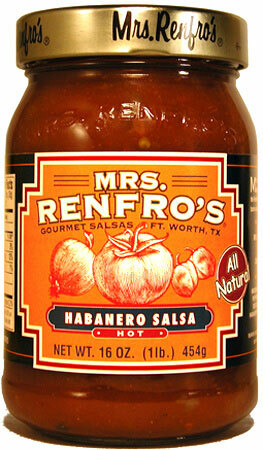 GearGuyd > Home > Mrs. Renfro’s Habanero Salsa – mmm Delicious Hotness! Do you like salsa? Do you like spicy foods? You NEED to try Mrs. Renfro’s Habanero Salsa. Seriously, this is the best salsa I have ever had. Besides the awesome hotness of this salsa and amazing flavor, I love that it’s a relatively natural food. Just look at the ingredients list: tomatoes, water, jalapeno peppers, onions, green chile peppers, distilled vinegar, corn starch, salt, habanero peppers, garlic, spices, cilantro. That’s right, no corn syrup, sugar, or artificial preservatives that I can’t pronounce. For the record, I’m not a fan of tomatoes, and so I am very particular about salsa and don’t enjoy most chunky, watery, or sweet varieties. You can buy this salsa online, but you’re better off finding them at a local grocery store.